Word Collage - All about apps in YOUR classroom! If summer is all about recharging the batteries, Word Collage can serve as your charging station. This incredible app takes your articles or content and reduces them down to the key terms, creating a collage of words that is an immediate conversation starter. For a video tutorial, see our Word Collage page. The common misconception is that this will simply be used for a Language Arts classroom since it is taking articles and extracting key terms. However, there is so much more to Word Collage that you need to see to believe. Consider yourself "charged up"! In Language Arts, have students use Word Collage to hypothesize the theme and characters of a short story. You can also take the contents of a current event, paste it into the text box of Word Collage, and have the students come up with their own news report based on the common terms. From there, you can show the students the article that you pulled information from and see how well it lines up! In Social Studies, much like in Language Arts, give the students a finished Word Collage of a historical article and see if they can re-create the events. Once they are finished, reveal the actual article and you'll be amazed at how many students are more engaged! In Science, pull articles about any of the major topics and allow students to create crossword puzzles that use the largest (most key) terms within the content that was used. Have students find an article about photosynthesis. Without reading (just have them quickly skim for relevance) the article, have them create a Word Collage. Based on the Collage created, what are the main steps in the photosynthesis process? Great anticipatory set! In Math (or any subject), have students fill out an online form in GoogleDocs about the problems that they have the most difficulty with from an assessment. Copy and paste the form into Word Collage and you will automatically see the problems from most difficult (largest numbers) to least difficult (smaller numbers). This is a great way to review for any major summative assessment for the instructor and the students. 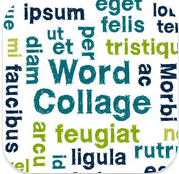 However you choose to use Word Collage, we would love to hear about and see your examples! Email us for student or teacher samples that you are willing to share or to ask us for more information.